This stylish portable counter top water filter is equipped uses Micro-filtration process and it is capable of effectively removing micro-organisms, including e-Coli bacteria. 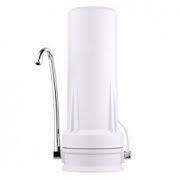 The counter top water filter is equipped with Carbon Block filter. The carbon block filter reduced chlorine, contaminants, taste and odour. This technology successfully reduce microorganism like cyst, Giardia, Cryptosporidium, E-coli Bacteria, Taste, Odour and Lead. All accessories are included: Spout, Diverter Valve, Hose & Adapter. > Spout that is attached to the base. Recommended Filter Replacement every 6 months or equivalent use depending on water condition. Call (416) 654-7812 or email us NOW! We will beat all competitors' prices by 10%.